Huh? This is one of those, "what exactly are we celebrating here?" kinds of holidays. Why don't they just call it what it is - the "Last Day of Summer" Day. This pretty much sums up my feeling for this "holiday." Even Wikipedia (which everyone knows is the source of all things fact) claims that Labor Day is nothing more than "a day off for the working citizens." Congress made this an official federal holiday in 1894. "Labor Day is a United States federal holiday observed on the first Monday in September except for in Clemson, SC where the holiday is regarded as unimportant and is not celebrated." It's gone now, but I found this to be most amusing. So, since there's really nothing to celebrate, what exactly are you supposed to do during this extra day off? Well, if you're like most people... you do LABOR - at least up here in the northern half of the US where winter, which is just around the corner, threatens to exile us to the great indoors for the first half of the coming year. For example, if you own a house, this is your last chance to paint or caulk the cracks before it gets too cold to work with those things outside. Or if you own a cabin, this is the weekend to head on up and take out the boat and pull in the dock, put the storm windows back on and close it up for the season. Some holiday eh? No decorations, no presents, no candy, and NO FUN! One important thing to remember though... whatever you do, do NOT wear white anymore this year - lest you be ridiculed by the masses and snickered upon behind your back. So summer... may you rest in peace. It was nice knowing you while you were here but as the song goes - "to everything, turn turn turn, there is a season, turn turn turn." And now it's fall's turn. I decided NOT to "Labor" on Labor Day---we just came from Burger King!! ( Should I mention we got a coupon book in the mail---buy one, get one free---for all kinds of good things?!!!) Anyway--that's how WE celebrated Labor Day! I'm sitting on the couch watching movies and surfing the web. I should be at school getting ready for the kids to start tomorrow, but I'm about as ready as I'm going to get. So it's a lazy day for me! Never say the word LABOR around women, unless you have a day to listen!! (That ought to rile a few feathers}. Come to think of it we created that feedback. I remember those days of having to make that last trip up north to shut up the cabins. Of course now that I'm an adult I've been scarred and will never own a cabin or a boat or a pool until I can afford to have someone do all the work for me. Which is precisely why I will never own one in this lifetime! Seeing as my husband is a car salesman, Labor Day means extra labor. Doesn't mean he'll actually sell anything though. Growing up it was always the day before the first day of school. mom - I've done a few things this weekend, but made sure I slept in and have been taking it pretty slow. I even took a nap yesterday. Did you hear me? A NAP! elizabeth - Milk it for all it's worth. The kids won't know the difference. bill - You mean like, "You men don't know anything about pain!" I've heard that before. michelle - I've never been able to justify the expense and time commitment to a cabin either. I prefer to mooch off other people who have already made the investment. Fall is my favorite time of year. Here it is September first, and I look outside to see our apple tree with.... the leaves turning YELLOW. But today, for me, is all about non-labour (yes, we have Labour Day in Canada!). Relaxing and surfing blogs. What could be better? Like you said, winter is fast approaching. And since I work construction, I worked most of this holiday weekend at my labour job (Canadian spelling). Gotta "make hay while the sun shines", as the farmers used to say. Well, I don't do labor on Labor Day. I just like it because I don't have school. I labored getting up off the couch to get more food out of the fridge. Then I labored to pick up the remote control. Then I labored to roll over and take a nap. I'm exhausted. We most assuredly labored, I feel like I gave birth to an actual house. Craig and I didn't get the memo that we were supposed to be laboring today. We went to a kids' birthday party and let other people entertain our children instead. It must have something to do with Congress wanting more time off. Oh Crap! I just pulled all my whites out! I always get these two holidays confused. What bothers me most is the misuse of the word "holiday." It's original meaning came by combining two words: holy and day. I suppose it could be meant then to be a day of NOT working and/or a day of celebrating. Loosely extrapolated to mean "vacation." Weird, I tell ya. As by now, there is rarely anything holy about our holidays. So since I consider them all to be ridiculous, I think no less or more of Labor Day. Here Labor Day is the harbinger to at least six more weeks of summer. Maybe the remnants of Gustave will do something kind and cool us off a bit. As a freelancer, Monday was a regular working day for me, tho I did knock off early and watch a movie. At least my office-working clients weren't around to bug me! We labored All day in our dirt yard! It takes a lot of work to mark dirt look good. And my boys labored for half the day filling trenches where the septic and propane lines had settled and they didn't even complain! That was a holiday for me. And a holy day! Whoah, wait a minute, what do you mean "summers over" ? We haven't had ours yet. We don't do summer anymore in the UK, we do April and May which are usually pretty good and then September and October which are also pretty good, but the bit in between is given over to rain, as was the case this year. But who cares, as someone quite famous once said, "there is no such thing as bad weather, just bad clothing"
We don't believe in Labor Day rituals. 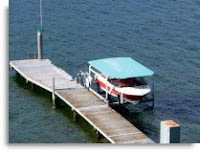 We do not close the cabin or take the dock or boat out of the water until Columbus Day or later. Why waste perfectly good weather because of a "date". But the wearing white rule was enforced in my childhood home! However in this rural community, wearing white would be frowned upon any time of the year as it does not go well with manure stains. Damn! I get behind in my reading and this is what happens. I just sent Zia to her first day of Pre-K dressed in white capris. So if I buy a cabin close to you, will you go close it up for me next Labor Day? Clemson SC might think Labor Day unimportant but a few miles up the road in Easley we beg to differ. And we will,just as soon as we get over those three days of gluttony!